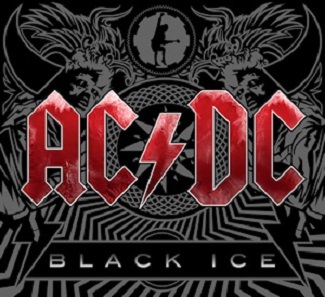 November 22, 2018 – On October 17, 2008, ACDC’s album Black Ice was released in the German-speaking countries, three days before the international release on October 20, 2008. It was the famous band’s 14th album and reached no. 1 in 29 countries’ charts, including Australia, Germany, Canada, Great Britain, and the United States. It was the second best-selling album of 2008. However, this success is not the only reason why the record made the news. It was more so because of the band’s decision to only release their album as a physical CD and not on any of the big music download platforms. 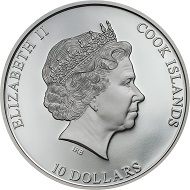 Cook Islands / 10 dollars / silver .999 / 2 oz / 38.61 mm / Mintage: 999. Black Ice plays an important role in the band’s history as it is the last album which was still recorded with the original lineup. During the recording sessions for ACDC’s 15th album “Rock or Bust” guitarist Malcom Young suffered a stroke. He passed away in 2017. The silver coin truly is a perfect representation of the “Black Ice” album cover. Coin Invest uses the cover of Black Ice on a coin minted to mark the 10th anniversary of the album. The title is reflected perfectly in the coin’s black proof finish, a technology developed specifically for CIT Coin Invest AG. The famous logo of the band including its bolt, which is also seen on the cover, is struck in high relief resulting in a 3D-like projection on the coin’s surface. Delicately tuned pad printing allows for the surface to be colored in red whereas the sides are black. 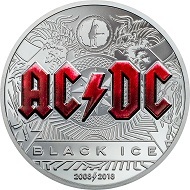 This new coin issued by the Cook Islands is not just a rarity for ACDC fans but also for all those collectors who are interested in the possibilities of high relief coinage. To learn more about this coin, please visit the CIT Coin Invest AG website. The official music video for “Rock ‘N’ Roll Train” from the album Black Ice is available on YouTube.